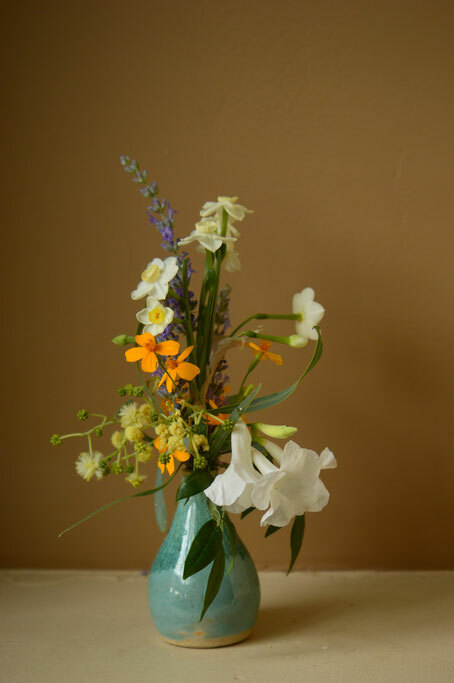 In a Vase: Which Season? 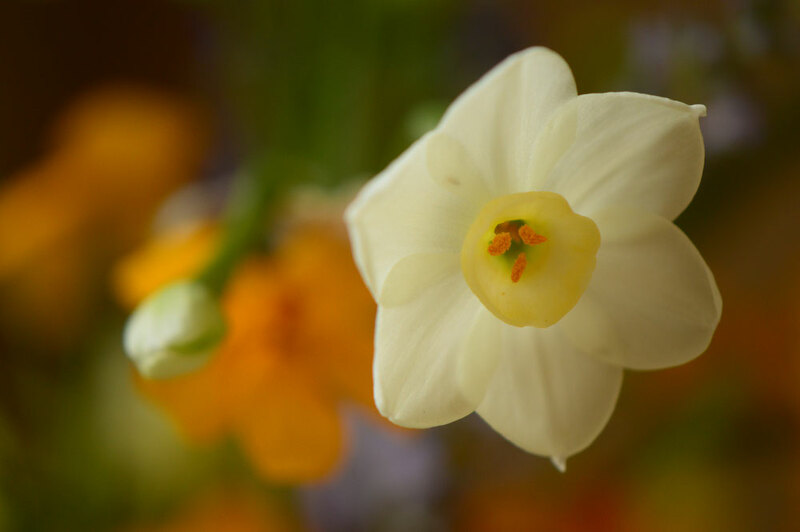 In yesterday's post the first of the Narcissus flowers were in bloom under the Acacia tree. This morning I found the first fully open blooms on the double yellow "Golden Rain". While I knew that "Autumn Colors" was a very early bloomer, I am more surprised by "Golden Rain". But whatever the season, the narcissus are definitely a presence in the garden now. So today I decided to go ahead and cut that first stalk of bloom from "Autumn Colors" for my Monday vase. Many more florets had opened in the meantime, so they made a ladder like this, with Lavandula x intermedia. 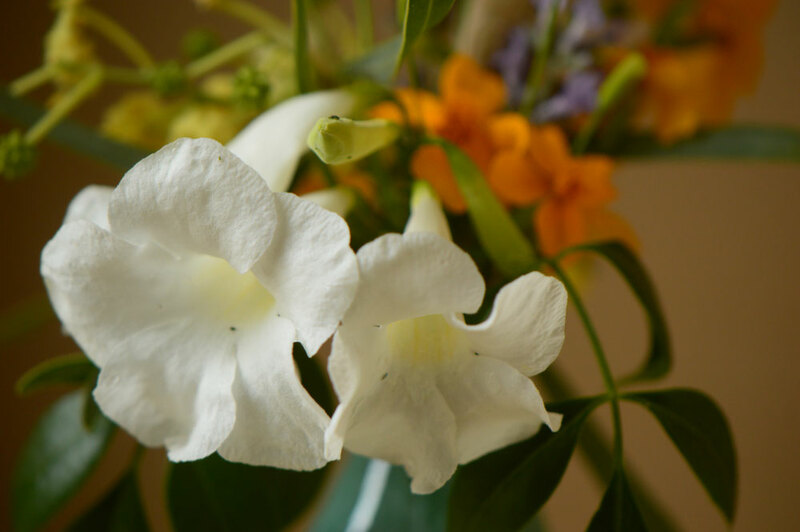 To combine with the fresh, creamy white of the narcissus, I cut a cluster from Pandorea jasminoides, which I am growing in a pot on the patio. These blooms are very white, and I think they must be P. j. alba though the pot was not fully labelled. I also added Tagetes lemmonii x lucida "Gold Medal" - a great deal of name for a plant of simple beauty. 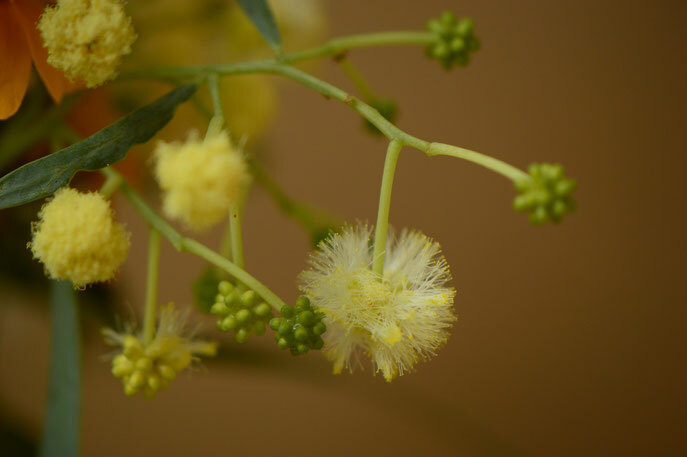 And there are a few lemon-tipped puffs from Acacia salicina. 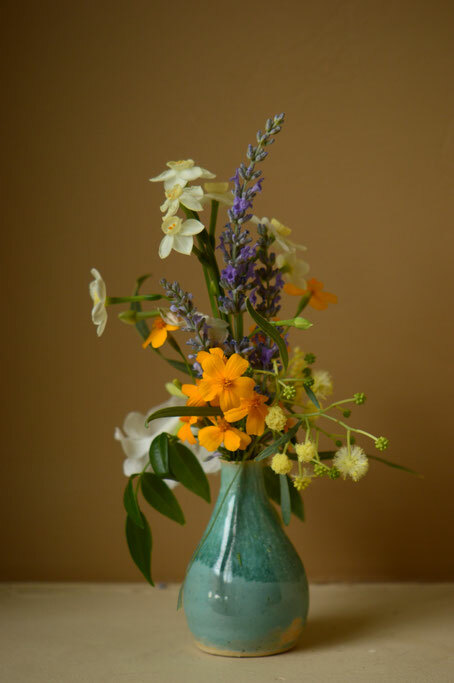 For all the variety, this was a slender handful of flowers and fit (mostly) in one of my smallest bud vases, a slim-necked vase whose blue-green glaze is accented with streaks from a flow glaze applied to the top section. It all seemed very fresh and, honestly, rather spring-like. Surprisingly so for the last Monday of November! 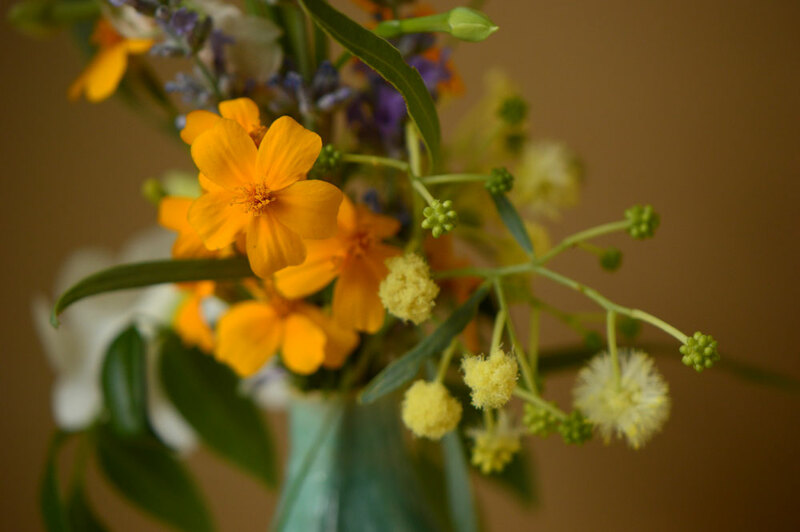 Thank you to Cathy for hosting In a Vase on Monday each week at Rambling in the Garden! A crossover autumn/spring vase Amy! LOL! 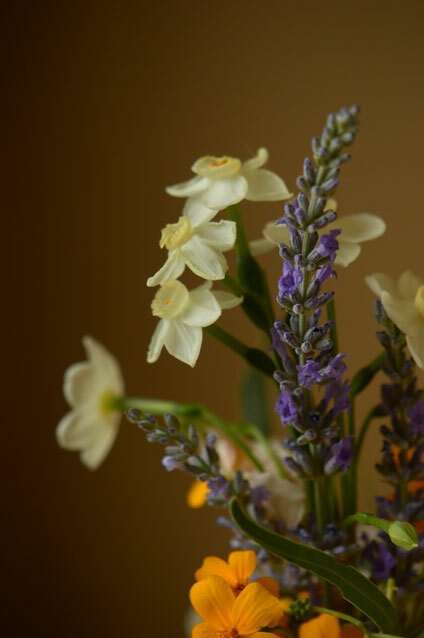 It is so refreshing to see Narcissi alongside lavender and Tagetes. Beautifully arranged in that gorgeous vase! You have an artist's eye for combining shapes and colours to give us a perfect arrangement. Cathy@Words and Herbs - Thanks very much! :) I was surprised by the combination myself but, oh, so happy to have them all in bloom! Oh Amy, my heart just skipped a beat! Your delicate arrangement is just so pretty and has induced an untimely longing for spring in my soul that is quite fearful of the cold. Wish I could spend the winter in your part of the world. 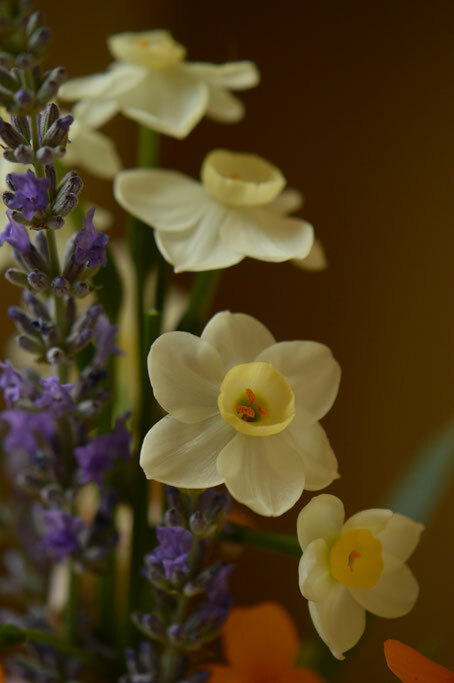 That daffodil is too charming and there aren't many that can combine them with Lavender. Well done! I love the structure of this vase as it rises to a slender top, like the shape of the vase....beautiful! Many thanks, Annette! It is such a lovely spot in the wintertime - stop fill of sunshine and warmth. I hope someday you can come enjoy it! :) I have to laugh about putting the daffodils with lavender, but there they were: both in bloom at the same time, so why not?! ;-) The season has been generous!